Kelly Weger turned heads Friday night with a breakout performance. The 5’8”, 185 lb. senior tailback sliced and diced his way to an 18 carry, 197-yard night---the highest individual rushing total since Jaylon McPeak gained 149 yards in a 2015 game against Glasgow. Weger’s big night combined with a stellar defensive effort enabled Allen County-Scottsville to down Greenwood 27-7. Weger was the offense spark for the Patriots. Weger used his quickness, toughness, and agility to provide Patriot fans with wow moments and be a thorn in the side for a coach William Howard’s Greenwood Gators. Weger pushed the Patriots to a 6-0 lead late in the first quarter. His 14-yard scoring run at the 2:56 mark broke a scoreless game. Thorny Walker’s PAT was blocked. After the Patriots’ score, Greenwood followed with an eight-play drive. Gator quarterback Zach Langevin scored early in the second period to tie the game. The PAT lifted the visitors to a 7-6 lead. Using the ground game to move the ball, the Patriots capped a second scoring drive at the 4:34 point of the second. Sophomore signal-caller Trace McIntyre tossed a 17-yard touchdown pass to senior fullback Peyton Huff. A scrambler and score by McIntyre on the two-point conversion gave AC-S a 14-7 lead. Hood also praised Huff for his play on the defensive side of the line. 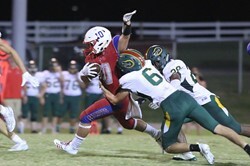 AC-S threatened to add a third first half touchdown late in the galf before a pass interception inside the Greenwood five-yard line ended the threat in the final first half seconds. However, AC-S would score midway in the third period to take control of the contest. Weger took the handoff at the Patriots own 39-yard line. The speedy back cut toward the Patriot sidelines, beat a Greenwood defender to the sidelines, turned up field and raced down the AC-S side line. His speed allowed him to pull away from the pursuit to score, lifting AC-S to a 20-7 lead. Walker’s PAT gave the hosts a two touchdown cushion. The Gators would threaten to score and get back in the game near the 8:00 mark of the fourth but the Patriot defense answered the challenge. A fourth quarter interception by Nathan Hogue ended the threat. Cayden Ross’s one-yard scoring run at the 2:16 mark of the fourth lifted AC-S to the 27-7 win. AC-S (3-0) will now turn their attention to a clash with the Glasgow Scotties (3-0) Friday night in Glasgow. The game will mark the 41st time the schools have met on the gridiron with the Scotties holding a 31-9 series advantage. Glasgow quarterback Tanner Abernathy completed 23 of 37 passes for 332 yards and four touchdowns in the Scotties first two games---wins over Russellville and Bardstown by a combined 70-7 score. Last week, Glasgow defeated Fort Campbell 37-0. Scottie back Nick Mitchell recorded 95 yards on the ground while Abernathy threw for 120 yards on six of 11 passing. Abernathy also ran for 48 yards and scored TD’s in the air and on the ground. margin-left:12.0pt;line-height:20.4pt;vertical-align:baseline'> The Patriots will be looking to down the Scotties for a second consecutive year. Last season, AC-S won a shootout 39-35. Kickoff Friday is slated for 7 p.m. at Hank Royse Stadium.